This pure bristle brush is best for fine hair, with 8 rings of extra stiff bristle tufts to stimulate blood flow to the hair roots. The density of the bristles allows conditioning sebum to be more evenly distributed from the roots to the ends of the hair. 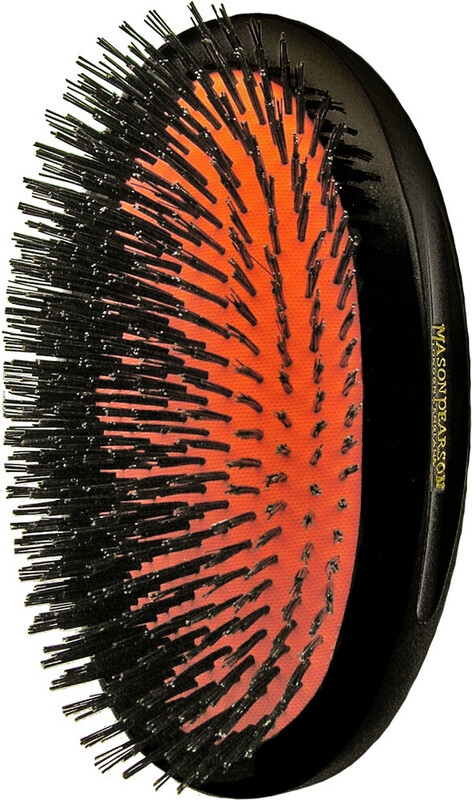 Mason Pearson Brushes Pure Bristle Extra Large Military B1M is rated 5.0 out of 5 by 2. Rated 5 out of 5 by AgnesM from The hairbrush - pure bristle extra large military - was a gift for my husband and he is delighted. He has never had any other sort and was very pleased to know that they were still on the market. The service was excellent - delivered the next day even though standard delivery was quoted. Rated 5 out of 5 by Happy from I got this brush for my husband and his hair has improved a lot. He has stubborn dandruff and has tried everything, his dandruff visibly decreased after using this brush. I'm buying him the softer one as it may be more gentle on his sensitive scalp. These are very well made quality brushes and I'm saving up to buy another brush very soon - Escentual is a joy to deal with.